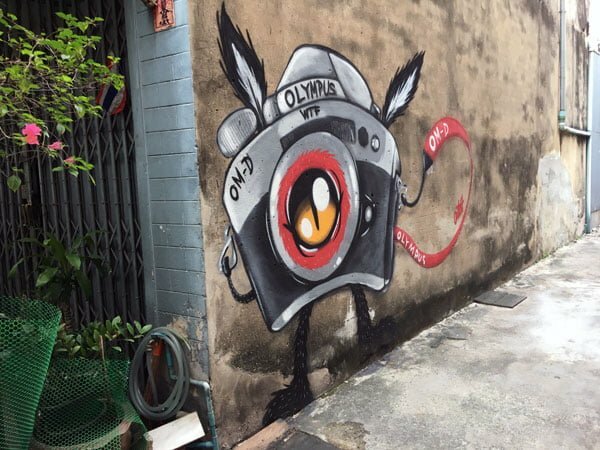 Bangkok is a gritty urban city, and while most visitors are happy to hang out in their myriad markets or shopping malls, many of its little alleyways hide some interesting street art which I had the pleasure of uncovering. 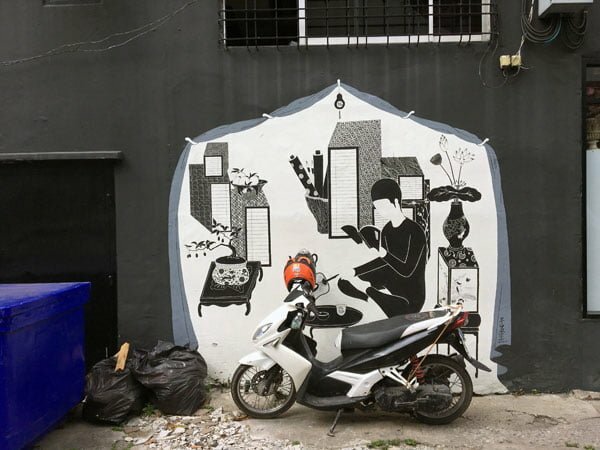 I’ve been to Bangkok many times – its proximity to Singapore makes it one of the best weekend trip options – but all I’ve done is mostly shopping and eating – this was the first time I went hunting for street art in Bangkok and I found a surprising number of artworks. 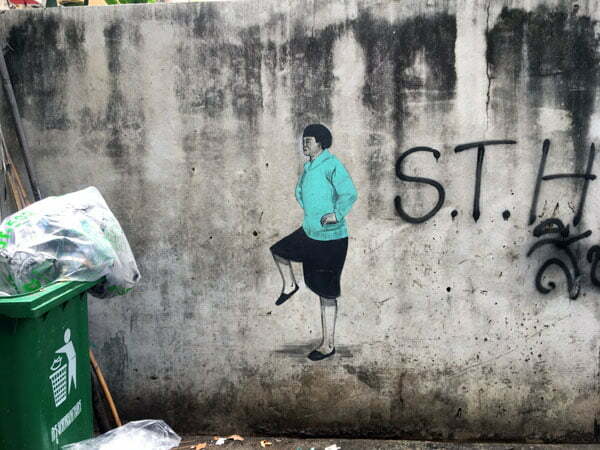 Here’s a guide on where you can find street art around Bangkok. As usual, handy menu and map to help you navigate, and I’ve listed the nearby landmarks and train stations so you can consider a quick detour if you are in the area! 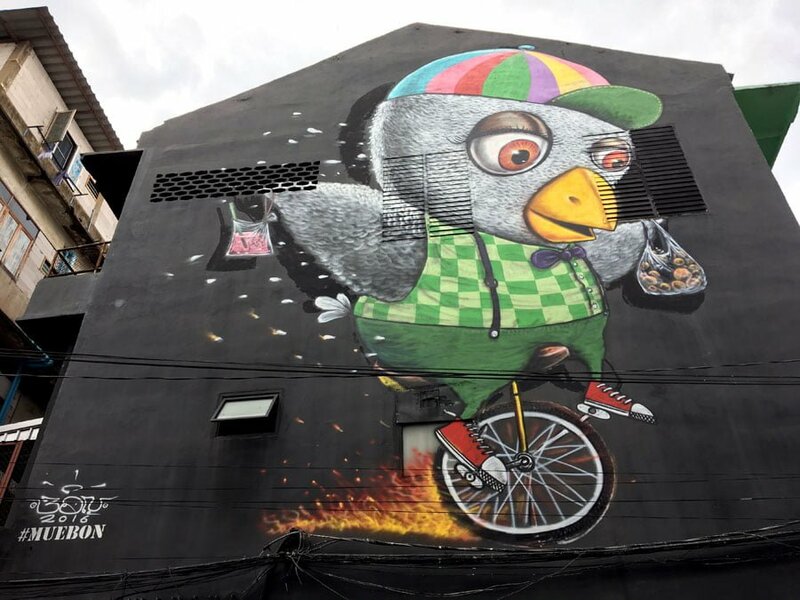 If you are looking for my other street art guides in Singapore or around the world, head on over here. This area is not far from Central World mall and easily accessed by BTS – the Ratchatewi station is closest although National Stadium BTS is also fairly near. 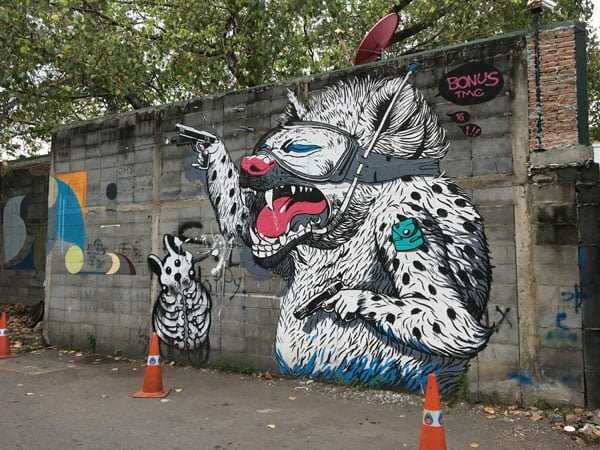 Many of the works from the Bukruk Urban Art Festival 2016 which brought in many foreign street artists can be found here. 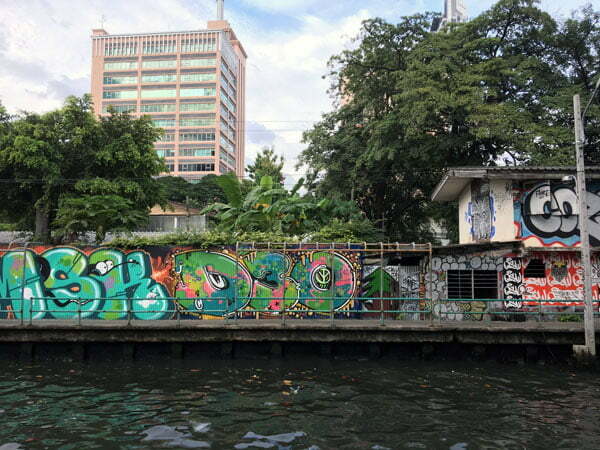 This stretch is found along the Chao Phraya River between Saphan Taksin and Hua Lamphong BTS stations. This area is near the Chinatown and quite a lot more industrial. 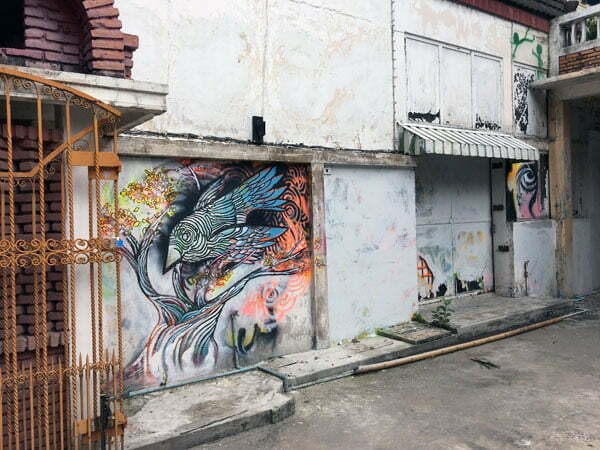 You’ll find yourself walking by scrap metal shops but look out for interesting art in random alleys. 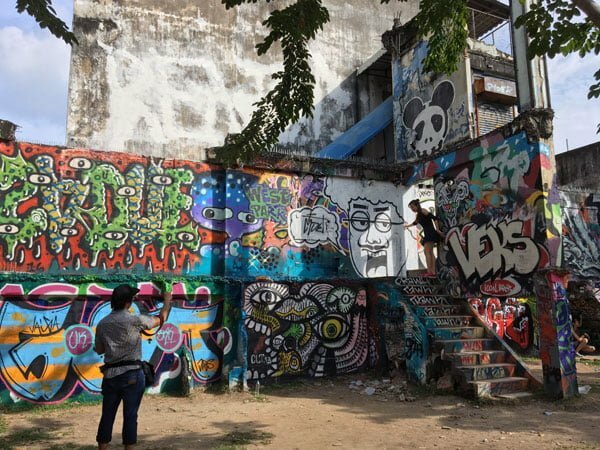 Chalerma is a park and playground covered with murals and graffiti and popular among the hipster crowd for getting their OOTD shots. 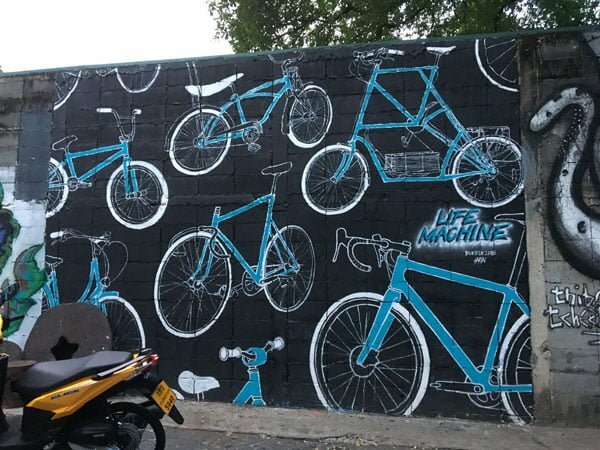 Make sure to check out the tiny lanes in the surrounding area – it’s a small bustling local community and you’ll see some works on the walls amidst people going about their daily lives. Getting there: exit Ratchatewi BTS station in the direction of VIE hotel. 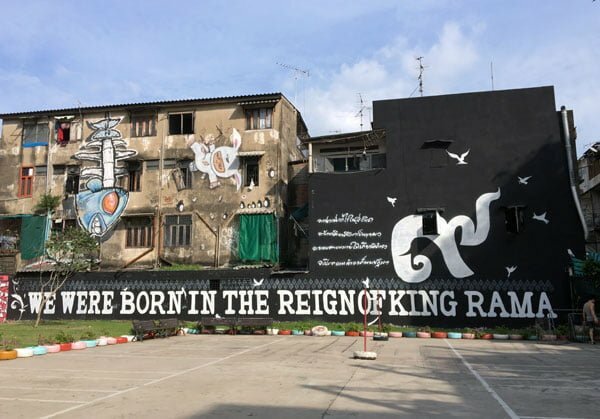 This little park can be seen along the main Phaya Thai road – the entrance is on Si Sirut or Petchaburi 18 Allery just off Phaya Thai. There is a large concrete space and you’ll see these large works quite easily. Spot the Alexface and Bon work! This work right outside the park’s entrance was particularly poignant because of the King’s recent passing! 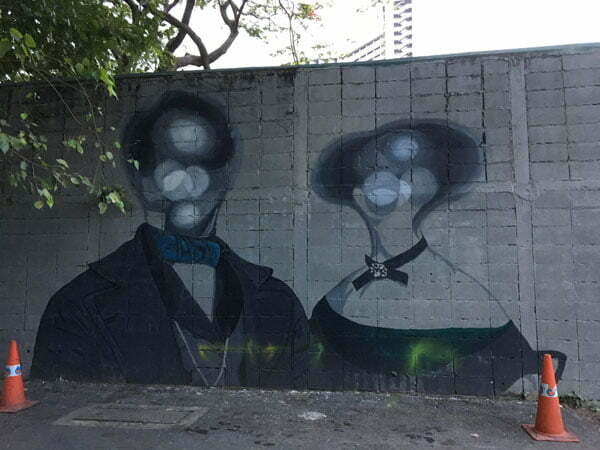 You can find graffiti style works all along the walls on both sides of this canal. 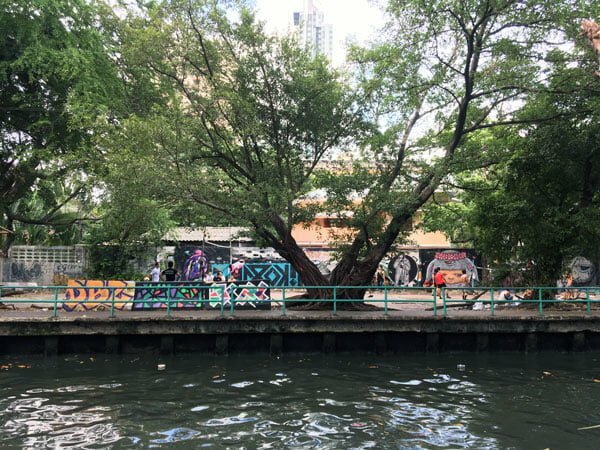 It sees a lot of human traffic as there is a ferry pier right at the bridge, and there is a small park on the opposite side of the river with more works and you might find locals playing some volleyball or sepak takraw. Getting there: exit Ratchatewi BTS station in the direction of Asia hotel – you should be walking on the opposite side of Phaya Thai Road from Chalerma Park (see entry above). Cross the river via Hua Chang Bridge – to your right there should be some stairs that lead down to Hua Chang Bridge Pier. 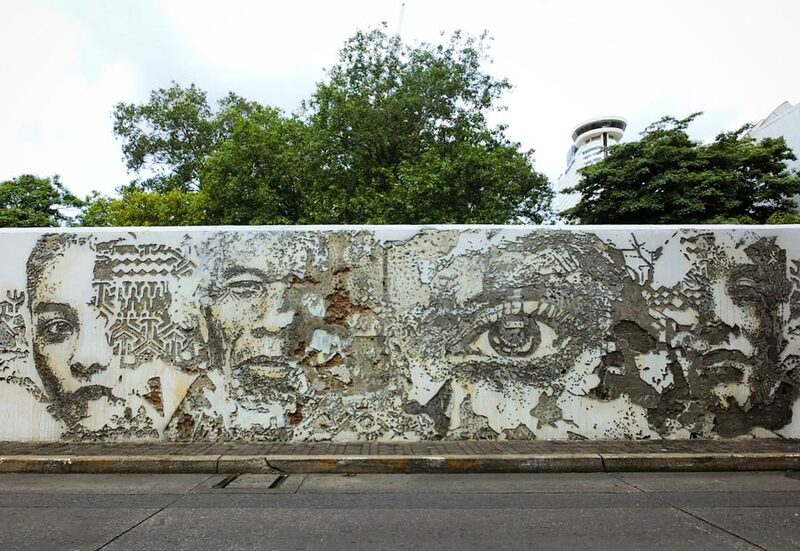 There are murals on both sides of the river as you turn left and walk away from the bridge. 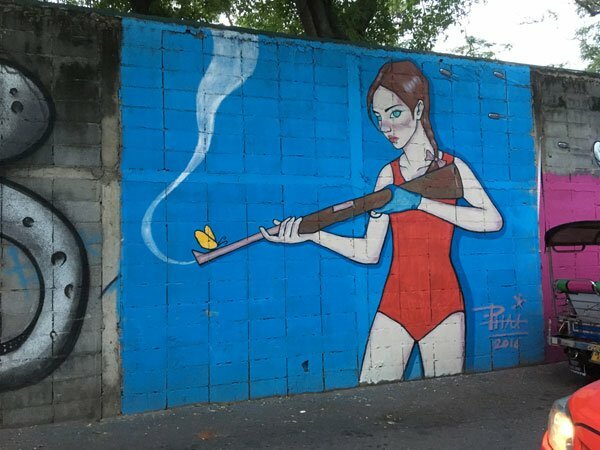 Right outside the train station is a work by Dutch artist Daan Botlek. He has a pretty interesting account of painting this wall, which was not the original one he had in mind! Still it’s quite an eye catching piece. Getting There: Take the BTS to Saphan Taksin BTS Station and go out by Exit 1. The wall belongs to Shangri-la Hotels and is located close to the river. In addition, take the stairs up to the flyover – walk on the left-hand side across the river. If you look to your left, you should see this cute rubber ducky anatomy by Nychos. 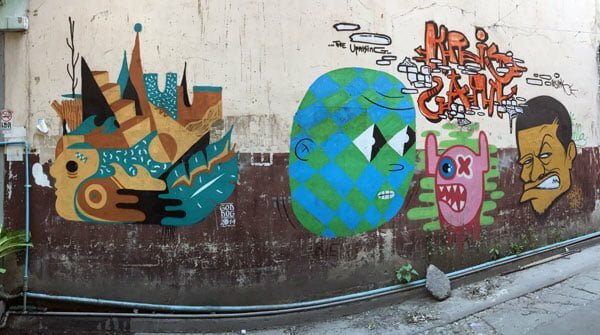 He’s got a pretty distinct style and a much better picture of his work on his instagram – I saw his work previously in San Francisco too! 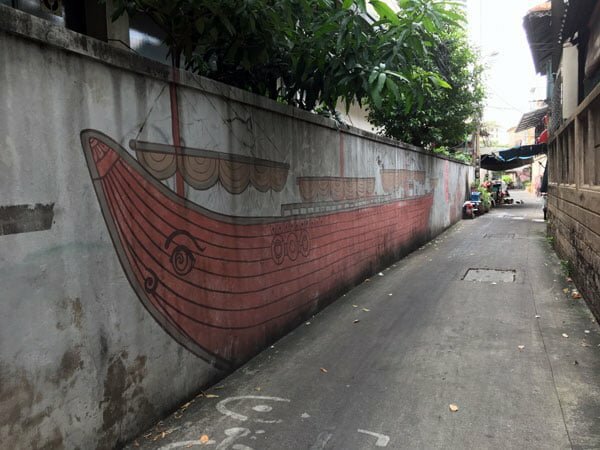 Charoen Krung Soi 32 doesn’t look like much at first, but walk down this road and right at the end you’ll see a very long wall on your right covered with works from various artists. There are so many works here that it’s impossible for me to put them all up, so here’s a little sample of what you can see! 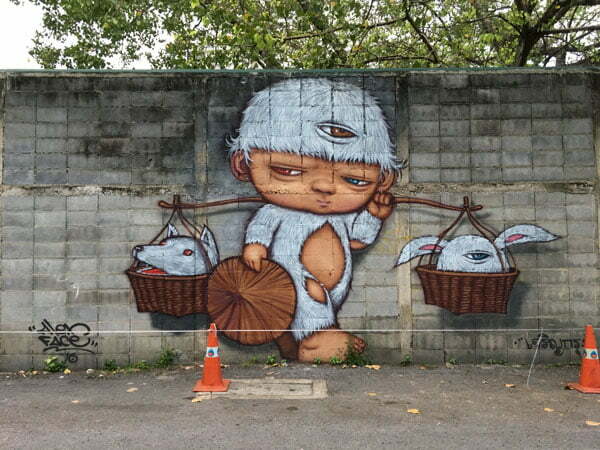 Thai artist Alexface and his trademark creature – you might have seen his works in Singapore or in Penang! 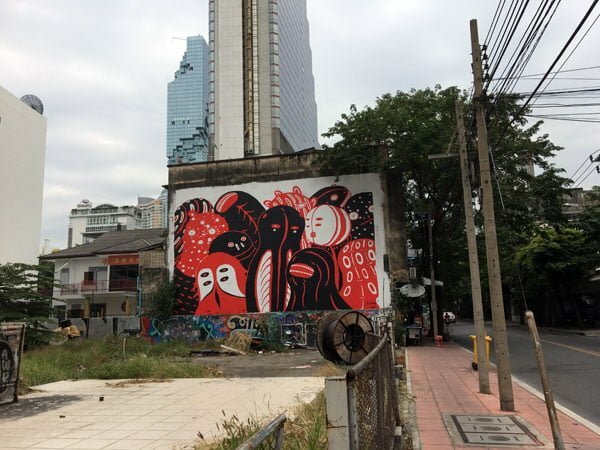 Just a bit further down from Soi 32 is Soi 30 where you will find two works – one by Italian artists Sten and Lex who work in a stencil technique that you might not even realise it is street art given its rather abstract nature, and another by my favourite Portuguese street artist Vhils whose works I first saw in Lisbon. 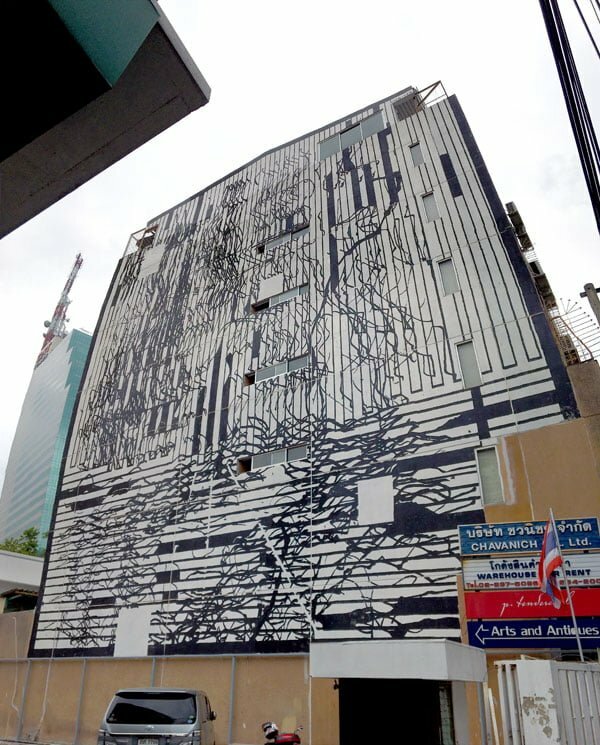 Getting There: You could walk from Saphan Taksin or Hua Lamphong BTS Stations – I’d see these works in conjunction with those in Soi 32 & 28. 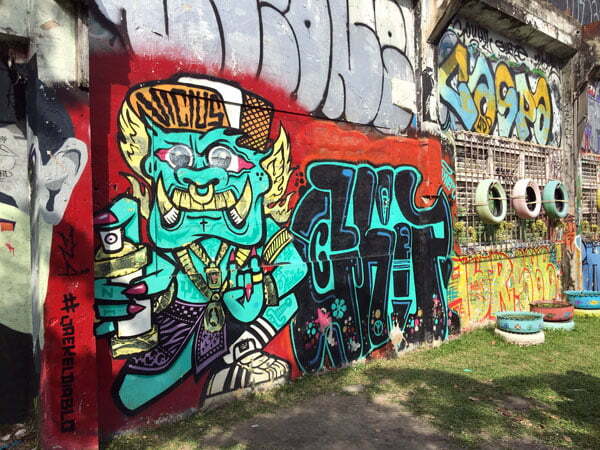 A short distance down from Soi 30 and 32 is this alleyway where you will find a number of works. It seems to be quite arty as you’ll find some little galleries hidden here as well! 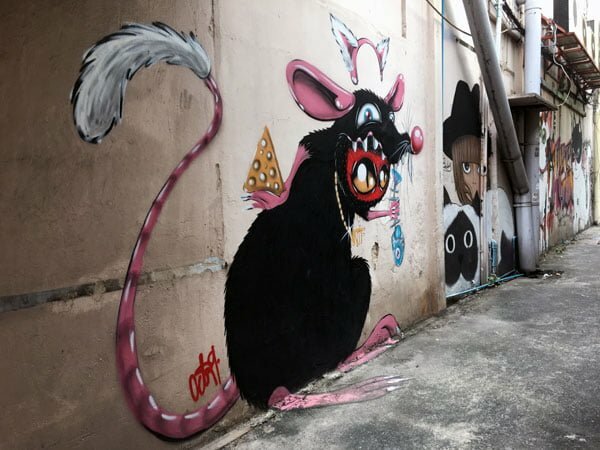 Make sure to cross Charoen Krung Road to another small alleyway just opposite where you’ll find food and a surprising number of cat and rat murals too! 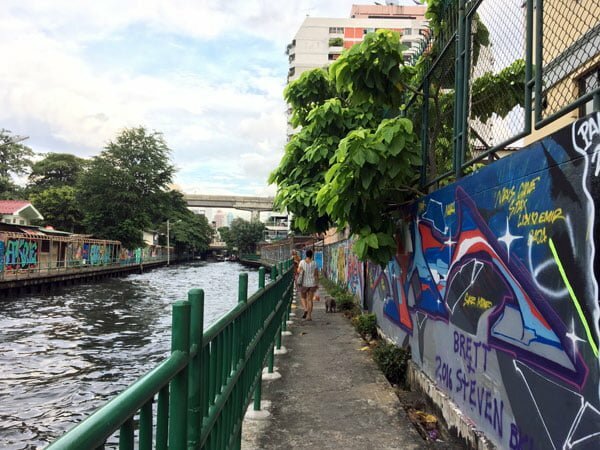 Getting There: You could walk from Hua Lamphong BTS Station which is closer than Saphan Taksin – turn left at the river and follow Thanon Mahapurutharam all the way down till you hit Charoen Krung Road. 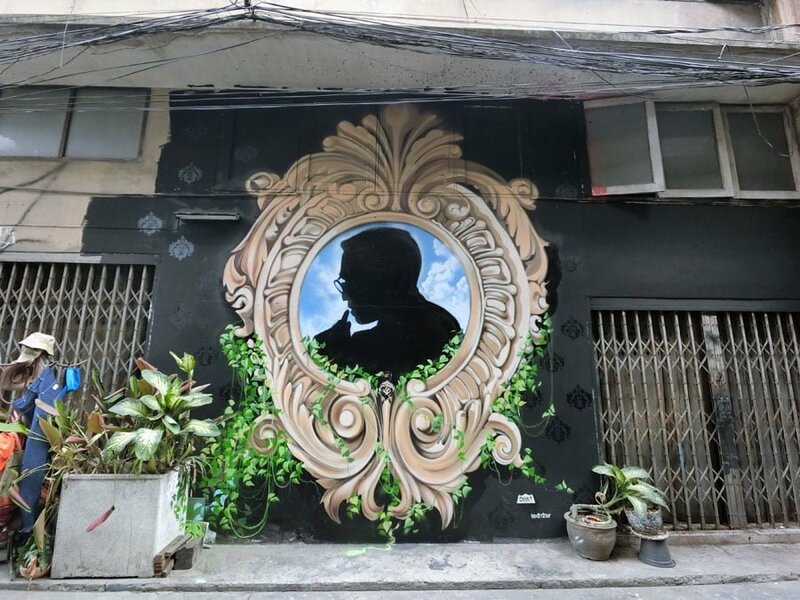 I’d see this alley in conjunction with those in Soi 32 and 30. Below Bon’s work is this small piece by Korean artist Daehyun Kim. This work is part of a long ongoing series called Moonassi. 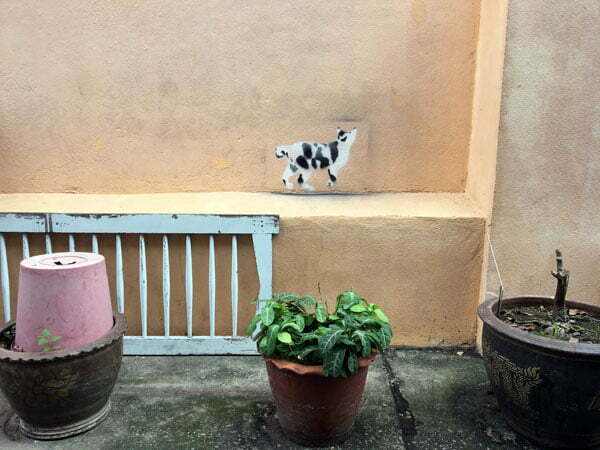 Look for these kitties in the alleyway across the street from Soi 28! 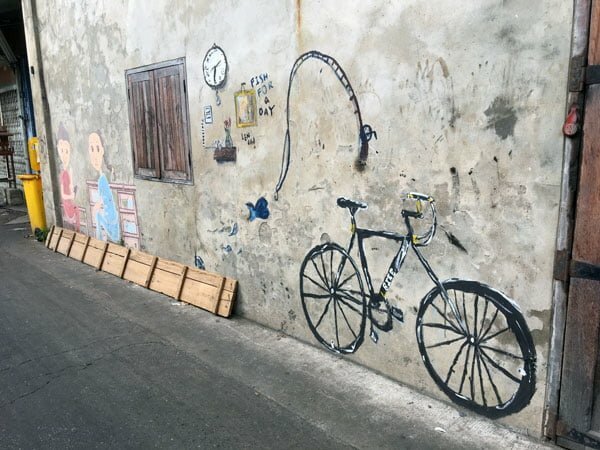 This work by a Japanese artist Motomichi Nakamura is a little out of the way in an empty plot of land along Decho Road, so not the most convenient stop! 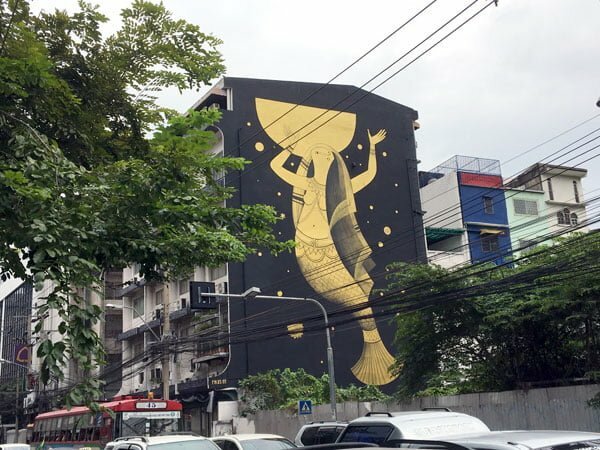 Greek artist Fikos has a rather interesting style – his golden mermaid is actually Sovann Macha, a ‘belief mermaid’ in Hindu and apparently Thai legends – more on that here. 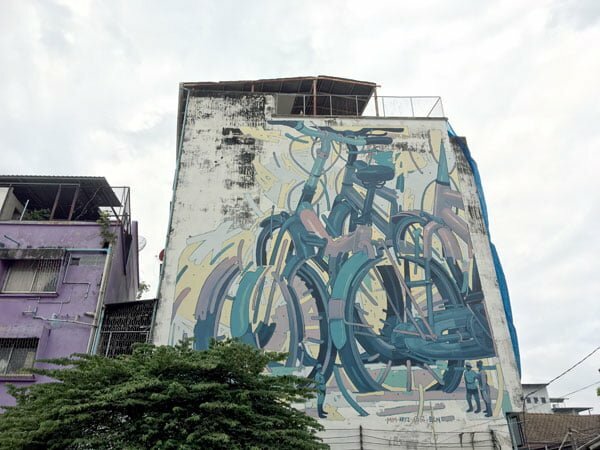 Getting There: It’s kinda in the middle of Bang Rak – I’d check out the Decho Road work along with this, or take a detour between Saphan Taksin and Soi 32 works! Soi Wanit 2 is a rather industrial area – lots of scrap metal and production related shops in this area, so it may feel a bit to be wandering around here to look for art. 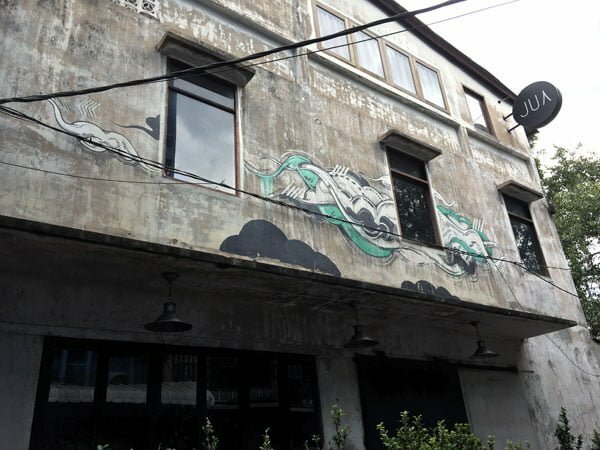 But as I found in Seoul’s Mullae district, art can be hidden even in the most un-artsy seeming areas. 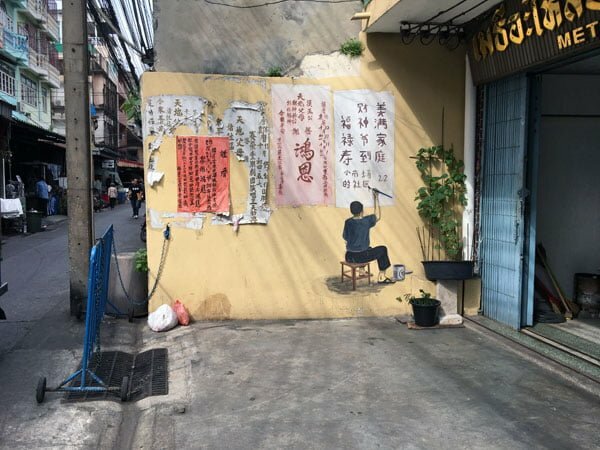 Walk down Song Chao Rong Kueak and Soi Duang Tawan and just wander around the back alleys – I found some subtle and unexpected works here. 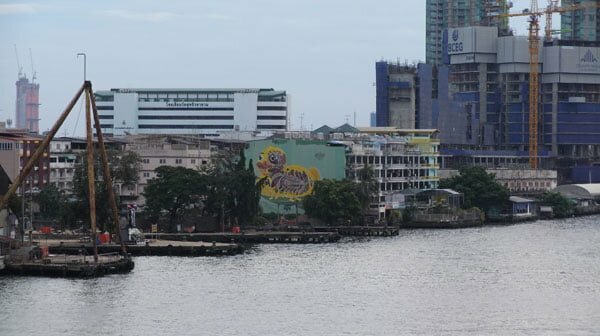 Getting There: Hua Lamphong BTS or the Bangkok Railway Station are your closest options, or consider taking a river taxi. 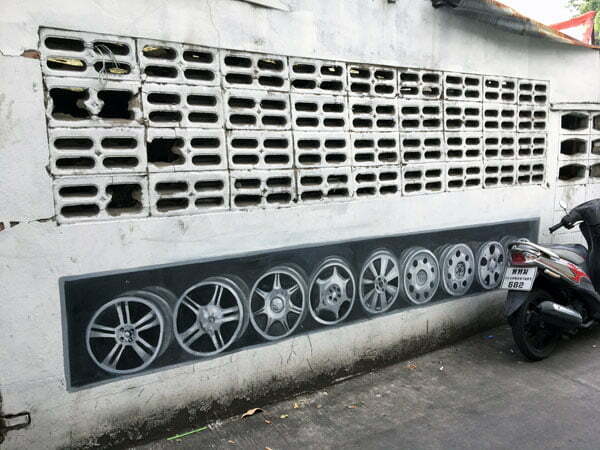 The works here are quite subtle – you might not notice anything amiss about this row of rims at first glance! Look around at everything closely! The works here don’t seem to be by any one particularly famous? This ship is quite long! 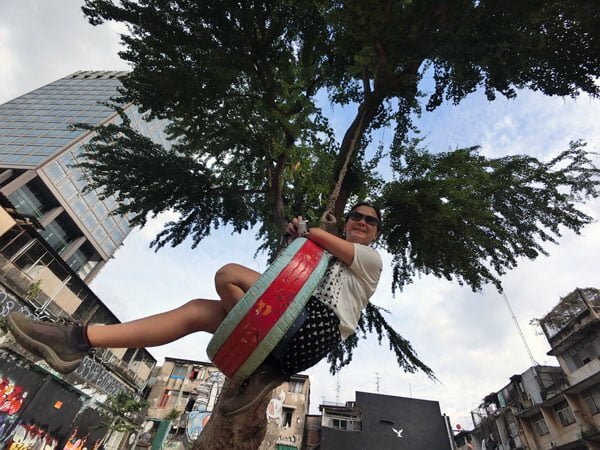 Getting There: Hua Lamphong BTS or the Bangkok Railway Station are your closest options, or consider taking a river taxi! 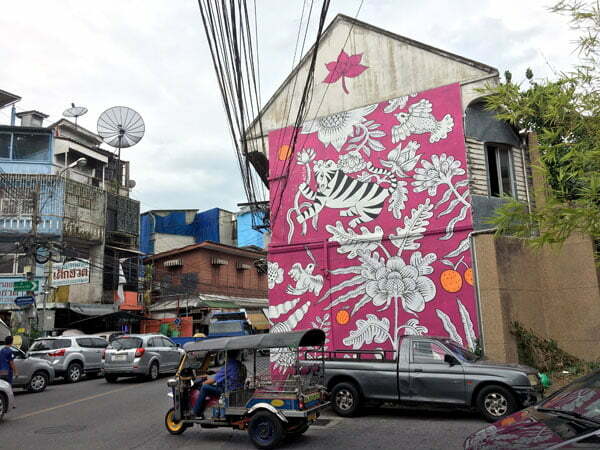 Walk up Song Wat Road and you should see Aitch’s work first just a short distance from the temple. 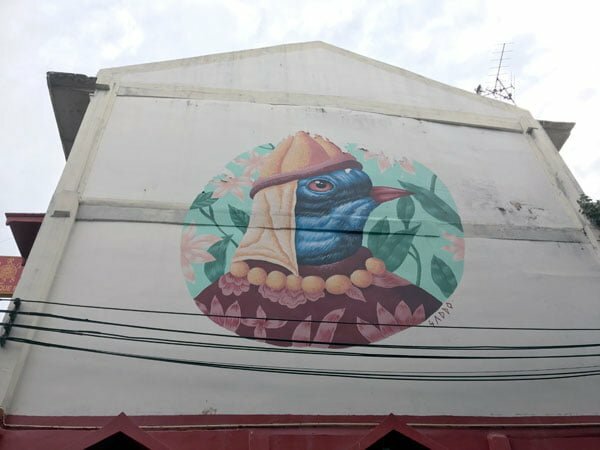 Walk another 2 blocks or so till you get to a carpark – you should see Aryz’s work facing you, turn around and Roa’s work is right opposite! 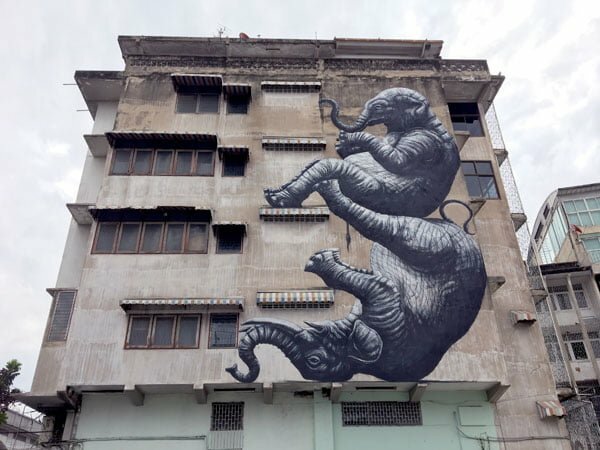 Spanish artist Aryz is also another artist whose works I’m quite fond of after spying them in Lisbon and Lagos. 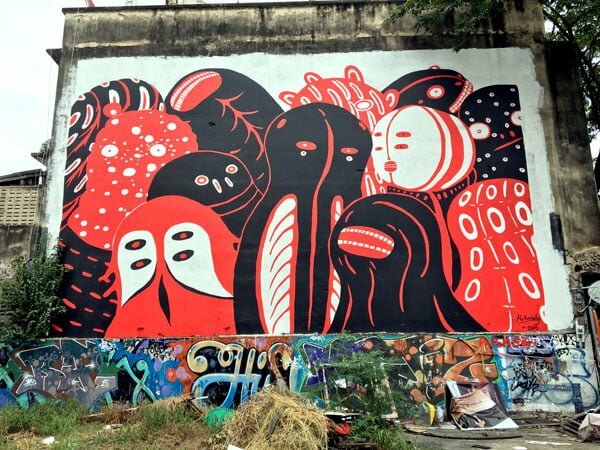 Looking for more street art works around South East Asia? 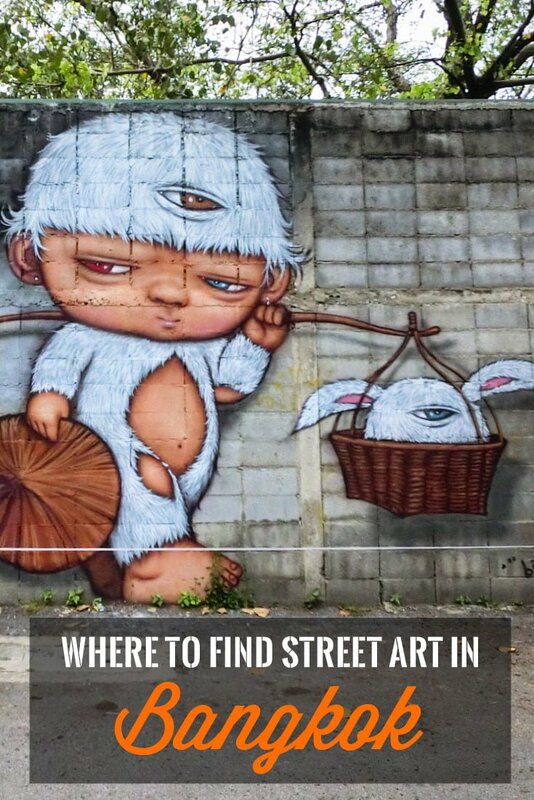 Check out the full list of my street art guides covering South East Asian cities like Singapore, Penang, and those further afield like Seoul, Melbourne, Manchester and San Francisco. Thanks! I used your blog as inspiration & followed lots of the trails. Will reference you in my blog in a month or so.